Assuming it’s legit, no idea why they wouldn’t post on the official forums. Two GAs in Feb, but no details on which kind they will be. Doesn't appear to have the Revan event on the list for 31st..
That's because Revan is technically a January event as it starts on 31st. They always do the "early release" there to help promote the game changer program. They release on the official forum at the start of the month. 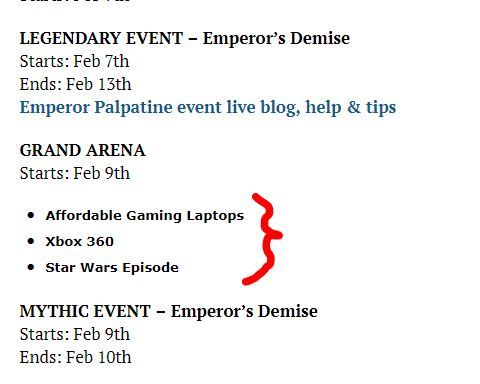 How else would you be able to find affordable gaming laptops, an xbox 360 or a star wars episode? Definitely need me one, singular, Star Wars episode right this kitteny instant! Whenever CG neglects us something BIG is just around the corner. Yep, wondering if that means droids, or if it means Solo content. Hmmm, L3. I was wondering why they did HK in July... Kinda like they did with E Scout in December for.C3PO and Boba with Slave for Chewie. 2 droids in 7 months. Probably something droid is coming. I think they mean if we quit this one that's what we can easily afford. I don't like gaming laptops, they get hot.